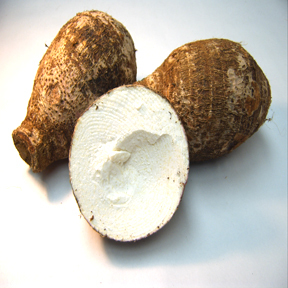 Dasheen is grown particularly as a root vegetable for its edible underground parts which consist of one or more large central corms and a cluster of tubers. Both corms and tubers have a cloth-like covering husk that can be peeled away to improve appearance. The corms can be roasted, baked, fried, and boiled like the potato. The natural sugars give it a sweet nutty flavor that tastes delicious. Handling: Fresh dasheen corms should be stored in cool, dark, well-ventilated place as in potato, yams, etc. Do not keep them inside the refrigerator, as they would sustain chilling injury. Taro greens, however, should be placed inside the refrigerator and used as in a way like other greens.